Any time someone asks me for trip planning assistance, there are several questions I have before offering any advice to sort of make sure I’m steering them to a trip that they will actually enjoy. One of the first and most important is “do you have any flexibility in when you go?” This is a big one, and travelers — especially inexperienced travelers — often fail to appreciate that there is a best time to go to Disney World or understand the significance that the time that you choose to go can have on your trip. For a lot of families in particular, the thinking may be, “OK, Spring Break is this week, so we’ll go this week,” and if that’s truly the only time you can go, que sera sera. If you DO have the ability to be more selective about when you go, however, you absolutely weigh the pros and cons of visiting at different times of year. The date you go can have a huge impact upon crowds, what you get to experience, weather, and even price, so it is worth devoting some effort into it. Read on to find out why it’s important, and how you can pick the best time to go to Disney and plan a trip that you’re going to love! Let’s get this out of the way right off the bat: if you are a family with school-aged children, the most convenient time for you to go is likely to also be the most crowded time you could possibly visit Disney. Not coincidentally, the busiest times to visit are the times when kids are out of school, because parents don’t have to worry about their children missing class on account of a vacation. As such, the times around Spring Break (usually mid-March to mid-April), Summer, Thanksgiving, and the time from just before Christmas to right after New Years see some of the biggest crowds of the year. The week between Christmas and New Years in particular can generate mammoth, awe-inspiring crowds that even make the “big” crowds at other times of the year seem manageable. Phased closures of the Magic Kingdom, where they stop allowing some guests into the park, are common during this time. If you’ve spent any time on any Disney message boards, you are probably aware that the question of whether or not you should take your kids out of school to go on a Disney trip is sort of an “electrified third rail” of Disney planning discussion, with opinions ranging from “you are a terrible parent if your children miss school for a vacation to Disney” to “you are a terrible parent if you don’t take your kids to Disney because you don’t want them to miss school.” Far be it for me to express an opinion on this hot topic one way or the other. This much should be beyond serious dispute though: if avoiding large crowds is important to you, going at a time when most kids are in school will go a long way in reaching that goal. Between omnipresent festivals and runDisney events, Disney has done a pretty good job of ensuring that there are no legitimate down times where you can reliably expect the parks to be “dead.” With that said, if times when school is out of session generate the biggest crowds, the times just after school has started back up tend to have some of the lowest. January (excluding Marathon Weekend and Martin Luther King, Jr. weekend), September, and the times between Thanksgiving and Christmas break all have reliably low crowds compared to the rest of the year. The reason is pretty simply — lots of families are just coming back from vacations over those breaks, and even the families that don’t mind taking their kids out of school for a Disney trip tend not to do it right after school has started back up. Crowd size and price tend to go hand in hand, and you can actually use one to predict the other. Not coincidentally, Disney charges the highest prices for rooms, park tickets, and even some restaurants during the busiest times of the year. On the flip side, it is common for Disney to offer promotions during the slower times of the year where you can save a significant amount as compared to going during peak season. Accordingly, going during the times when the crowds are the highest also tends to mean that you’re going to spend much more on your trip as compared to lower times. 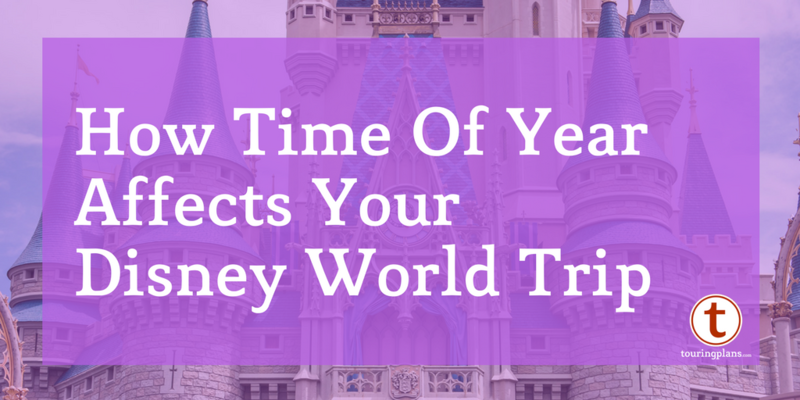 Just how big a difference does the calendar make in choosing the best time to go to Disney World? Take a look at the rack rates for your hotel. As an example, a standard room at Disney’s Boardwalk will cost a low of $459 on January 2 (a weekday – 2017 rates). The same room will cost $730 a night the week of Christmas and New Years. And that’s before any discounts offered on the January 2 rate. Even a Disney Value resort like Pop Century will have a difference of $137 ($255 vs. $118) for those dates. Multiply that by a 5 night trip and think hard about when you travel. And wait times? On January 19, 2017, a date we saw a “3” crowd level, the peak wait for Seven Dwarf’s Mine train was 75 minutes. On December 30 (10), a few weeks before, it was 150 minutes. You could potentially spend an extra half day in waiting in line over the span of a trip. These, of course, are broad strokes. For to-the-day information on when you’ll see the biggest and smallest crowds, consult our Crowd Calendar. We post rack rates on the individual Disney hotel pages. You might be reading this and thinking, “gee, bigger crowds and more expense, why would anyone voluntarily go to Disney World during the high times?” Well, when you go can also have an impact of what you get to experience, and how much available park time there will be. Disney typically wants to have as many attractions running and in tip-top condition as possible during the busy times, and it runs the longest park hours during these times. 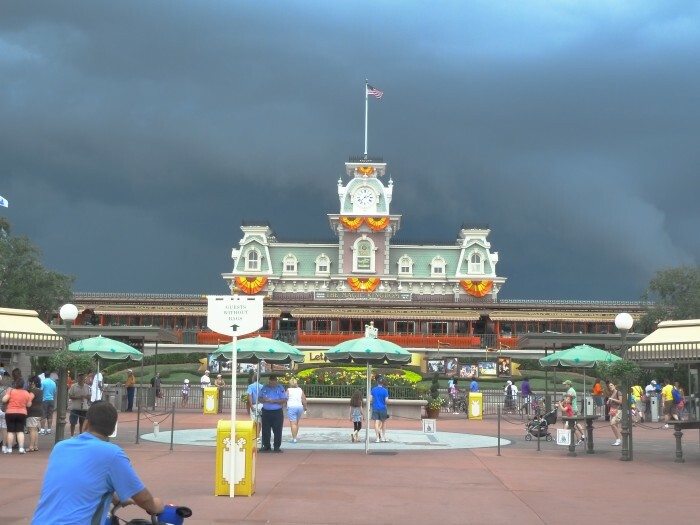 Additionally, Disney will often run parades and shows more than once during the peak times, whereas you may only see them once, and occasionally shows will be dark, during the lower times. 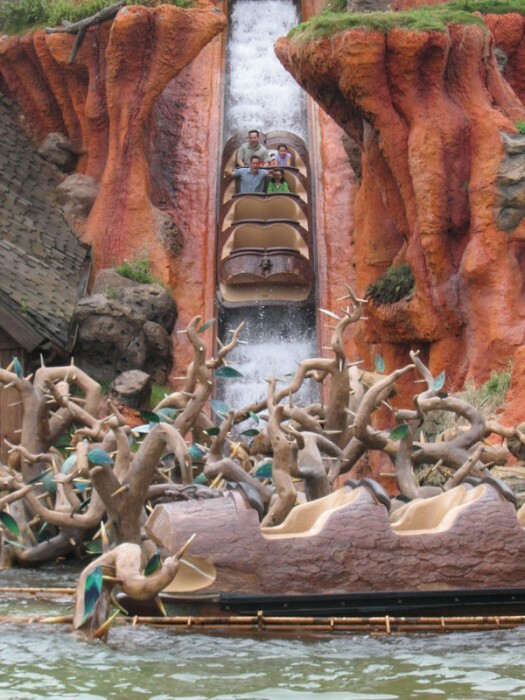 Want to get soaked on Splash Mountain? Best not go in January. Also, it’s pretty common for Disney to take advantage of the slower times mentioned above to service their attractions. For example, because getting drenched and walking around a theme park isn’t near as much fun when it’s cold as it is in the summer, Disney routinely uses the cooler winter months to take Kali River Rapids and Splash Mountain down for refurbishment (usually in January). Similarly, it is typically the case that Disney will take both of its water parks offline for service during the winter — not both at the same time, but you’ll only have one to choose from. Accordingly, if these water rides or the water parks are a critical part of your trip, you’re probably going to want to avoid the winter months. Other attractions are a bit more of a crap shoot, but it’s fair to say that if Disney is going to take a headliner attraction down for routine maintenance, it is far more likely that it’s going to happen at a time when it’s expected to be slow than the middle of summer or the Christmas season. With most lengthy refurbishments, Disney will announce the closure with enough advance notice that you can plan around it or adjust your schedule as necessary. Especially if there’s an attraction that you are really eager to experience, make sure you check out our Disney World Refurbishment Schedule before you book your trip. Especially during Food & Wine in the Fall, expect the Epcot resorts to see higher demand. People have known to get pretty intoxicated during Food & Wine on weekend evenings at Epcot in particular. As such, it has a reputation for not being as family friendly. The food kiosks set up during these festivals can obviate the need to get ADRs, because you can very easily cobble together a meal by grazing on the small plates. In fact, grazing your way around Epcot can be a pretty fun way to eat! If nothing else, it’s a good fall-back plan. The Magic Kingdom also gets its fair share of special events in the fall and Christmas season, hosting two evening parties. Mickey’s Not So Scary Halloween Party starts in late August (yes, really, because who isn’t feeling the fall vibe in August) and runs through just after Halloween, and Mickey’s Very Merry Christmas Party starts more or less immediately thereafter and runs through Christmas. They are both great events and I think I can safely say that most people would agree that they are worth doing at least once, but unlike the Epcot festivals, they charge separate admission (they are “hard ticket” events in Disney-speak), and they ain’t cheap, so it’s generally something that you’ll do once per trip, if at all. Here’s why it matters from a trip planning standpoint: on the one hand, they are great events, and going is a worthy cherry atop any trip. With that said, from late August through Christmas, the Magic Kingdom will close at 7 pm three or four nights out of the week. 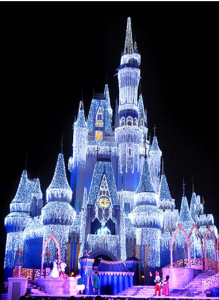 If spending a lot of time at the Magic Kingdom is a priority for you, especially in the evening, the inability to do so without paying extra roughly half the week might matter to you. For example, we visited during early December once, staying at Bay Lake Tower at the Contemporary Resort. Part of the reason we stay there is that we love walking over to Magic Kingdom most nights. Well, we found that not being able to take advantage of that proximity was a bit of a bummer, so while I wouldn’t be averse to going back that time of year, we’d probably stay elsewhere if we did it again. Pro Tip: adding the Park Hopper option to your tickets can deliver a lot of value during party season, because the Magic Kingdom often has really low crowds on party days. You can accomplish a lot during the day, and then hop over to another park in the evening once the party gets going. The other events worth being aware of when planning are runDisney events. Weekends when there are races attract large crowds, and while these crowds don’t have as big an impact on lines for attractions as you might imagine, you will likely notice when it comes to hotel availability, traffic, and general congestion around the resort. Also, in the morning hours of the longer races, your ability to move around freely may be compromised. While these issues aren’t insurmountable and there’s a great energy at the resort over race weekends, it would be tough to recommend visiting during a race weekend if you aren’t either racing or supporting someone who is. Races at Disney World are in January, February, April, and November; check runDisney’s schedule for the most current dates. Obviously, the time of year that you go is going to have an impact upon the weather you’re going to see, but less obvious is how it differs. Here’s an understatement: if you go to Walt Disney World from June to August, it is going to be hot. Like, surface-of-the-sun hot, which is further enhanced by why-didn’t-I-just-jump-into-a-pool humidity. It is frankly not a particularly pleasant time of year to visit from a weather standpoint. There’s more: Orlando’s rainy season runs from June through September, and during this time, it might very well rain every single day. Granted, that rain will probably come in the form of a brief, but torrential, rainstorm in the afternoon that will briefly cool things down, but you should be aware that you are almost certain to deal with rain during the summer months. 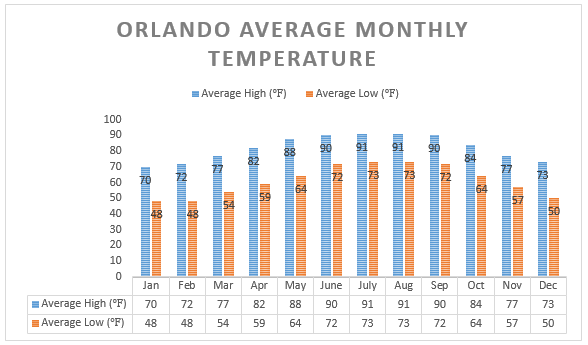 On the other end of the spectrum, while Orlando rarely gets legitimately cold, the weather in the winter months can be much more mild — and drier. Of course, if swimming is a big part of your trip — and we know that for many families, spending time at the pool is as much a part of the trip as the parks — it may not be warm enough for you to be in the mood to go swimming. The pools are heated and lots of families do it anyway, but you may or may not get legitimate swimming weather in December-February. Sooo, When Is The Best Time To Go To Disney World? If the only time you can make a trip work is when the kids are out of school, Spring Break is probably the best available option. Unlike Thanksgiving, Christmas and New Years, which are obviously fixed dates for everyone, not all school have Spring Break at the same time, so the crowds are high but not ridiculous over the few weeks in the Spring that schools use. Additionally, Spring Break should be warm enough that you’ll be able to take advantage of Disney’s outstanding pools, but you’ll miss the cartoonish heat that you get in the dead of summer. If it’s not necessary to plan around school-aged children, early May and September-October are good times to target. The weather is reasonable but still warm enough to enjoy a dip in the pool, you’ll be able to take advantage of the festivals at Epcot, the crowds are manageable, and most attractions should be available to you. The only caveat is that the longer the trip, the more you’ll want to take into account the fact that the Magic Kingdom closes early if you’re considering the Fall. 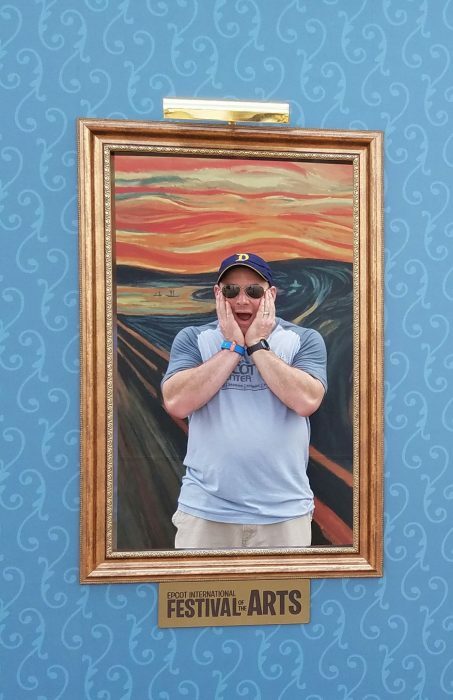 One of the greatest things about Walt Disney World is that is can be so many things to an incredibly broad swath of people. I have tons of friends that love Disney, but that doesn’t mean we love the same things or experience it the same way. Even speaking of myself, I love the trips I take with my whole family, I love the trips I take with just my wife, and I even love when I have occasion to be there by myself, but they are completely different experiences. The flip side of this incredible breadth of appeal, however, is that the planning process and approach to a trip is not a one-size-fits-all affair, and there are several variables that can prompt significant departures from the “traditional” planning advice you see. This article highlights one of the most important but often overlooked variables, time of year, but there are plenty of others. For example, one VERY common question is how to use the 3 FastPass+ reservations. Objectively speaking, we know that at Magic Kingdom, FastPasses will save you the most time waiting for Peter Pan, Seven Dwarfs Mine Train, and Big Thunder Mountain, but if no one in your traveling party does roller coasters, two of those aren’t going to help you at all. Similarly, Chef Mickey’s is an enormously popular restaurant and a tough ADR to get, but if character dining isn’t your thing, it’s not a good use of your time. Expect to see these and other Disney planning variables covered in future articles! What is your favorite time to go and why? What are the events that you’ll make a special visit for? What other variables are you interested in learning about? Let us know in the comments! When our daughters were at school we found that, although in the UK school starts early September, in the USA a lot of schools start back in mid August. As we decided not to take our girls out of school (tried it once and the girls were devastated that their classmates had been doing stuff without them!!!!) we used to go the last 2 weeks in August. Now they are older we have been the last two years in September – for me it’s still incredibly hot but not as busy by far as August. I loved it when my husband and I went last week in November (Black Friday) and the first two weeks in December – all the Christmas hype etc without the crowds. Only draw back was that even we Brits found it quite cool especially in the evenings the year we went. We’re from New York City and like the UK, schools don’t start until after Labor Day. That’s why we’ve always gone at the end of August. This might work in reverse for schools that end very early in May or June where those families should go right at the end of the school year. Yes! This is a great article. James, at the risk of veering just slightly off-topic, since you mentioned the “traditional” January closing of Splash Mountain as an example, some planners may want to know that this year we’re instead seeing a fairly lengthy refurb in September/October/November. Allegedly there’s already a big chess game under way in moving all the major refurbishments around to get ready for the 50th in a few years. Definitely a fair point, these are indeed broad strokes. All the more reason to check the refurb calendar regardless of when you plan to go down! One thing you did not mention in your section on weather is hurricane season. Late August thru early October is peak hurricane season. Sometimes this does not matter, but I think people should be more aware of this when planning a trip to Florida. I know hurricane Matthew affected many people last year. One other tip that I haven’t seen mentioned very often is to take into account daylight savings time (and sunset times in general). For parents of young children who know they will be leaving the parks relatively early each night, going when it gets darker earlier means you can still enjoy the nighttime atmosphere, even if leaving the park by 7pm! It also generally means nighttime parades and fireworks happen earlier so there’s a higher chance your kiddos will still be awake for them. Yes! Great point! When we go in the winter, I check the schedule to see what day of the week the fireworks are happening the earliest and pick that day to visit MK! 8pm fireworks work just fine for my kids. 10pm fireworks would be out of the question! And even getting back to the resort no later than 9pm each day on our trip in February, we still got to enjoy lots of after dark atmosphere! One thing that is a major decision maker for me is what weather I am missing back home. Florida has great weather in May, but in Northern Ontario where we are, May is a great time of the year. The snow has all melted and the sun is generally shining and we finally get to pull the shorts out of storage. I’m not looking to escape Northern Ontario weather in May. In January or February however, leaving 2 feet of snow and gray weather behind to arrive in sunny Florida, with green grass and palm trees, feels like heaven to us (even if it’s a bit cooler by Florida standards)! Totally agree with this from here in Massachusetts. From about May until October the weather in New England is spectacular (IMHO), so shelling out $$ to head south doesn’t make much sense to me. I also enjoy the colder “holiday season” weather of November and December (feels more festive). When my winter blahs really set-in, around February/early March, it’s the perfect time for an escape to Disney! I laugh whenever anyone mentions the “depressing” heat in Florida in July and August. Here in the midwest, we are excited when the high temperature DROPS to the low 90s on any given day (and its not a dry heat here, either). Temperature is subjective. Alaskans may enjoy going to a water park in January when the temperature is in the 60s. Very good article! I’m married to a teacher so I have all kinds of experience with the removal of kids from school debate. Because of that situation, I’m also limited in my potential travel dates but with some good planning, research and a subscription to Touring Plans virtually every obstacle can be overcome! Keep up the great work and tell Len you need a raise!